Op amp is the commonly used name for operational amplifiers, which are widely used electronic components. Op amps are often seen on many surface equipment designs and logging tools. The name â€˜operational amplifierâ€™ comes from the use of such high gain amps in performing mathematical operations for analog computer operations and is said to have been coined in 1947. A lot of study was done in the field and the initial operational amplifiers, based on vacuum tubes, were a result of the research done in Bell labs. By 1960â€™s, vacuum tube op amps had given way to solid state devices and hybrid operational amplifiers were entering the scene. The first IC operational amplifier was developed in 1963 by Bob Widlar and was called Fairchild ÂµA702. It was not a success because of a number of bugs. But Widlarâ€™s next design, which was the ÂµA709, was hailed as milestone in design. A number of designs followed including the very popular ÂµA741. A number of precision op amps like OP7, OP27 and OP37 are commonly used in logging electronics. In the initial days, these electronic components were based on NPN bipolar process and because of the slow PNP transistors of the time; the speed of the amps was limited. The LM118/218/318 model tried to solve the problem but did not meet with much success. 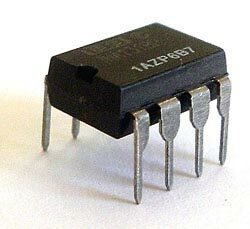 The only fast IC op amps were the ones owned by Harris, the HA2500 as well as the HA2600, and were quite popular despite their high cost. FET input operational amplifiers though highly advantageous in downhole tool applications, did not enter the scene due to engineering problems. However with the introduction of the ion implantation process in 1974, their manufacture became possible and the LF155/156/157 series was introduced by National Semiconductor, and OP15, OP16, and OP17 by PMI. The TL06x, TL07x, and TL08x models introduced by Texas Instruments (TI) in 1978 went on to become industry standards. The CA3130 employing a P-channel MOS input with a CMOS output, set the stage for CA3140 having a MOSFET input and a bipolar output which caught the eye of many logging tool companies. This model has many advantages including good bandwidth and military temperature range, and continues to be used and manufactured even now. This entry was posted in Op Amps and tagged Guides, history, IC's, Op Amps October 9, 2008 by Andi.